It’s November 2013, and a lifter is about to lift. Feet are planted beneath shoulders, toes are pointed due north. Open hands descend beneath knees, then lock onto the knurled iron bar with a matching iron grip, over and under. Clavicles hover parallel to the bar which is complemented on either side by metal plates: 181 pounds of entropy, all told. The lifter doesn’t notice that the iron bar is as cold as a corpse. That cold flutters upward on vulture’s wings as the lifter’s shoulders rise. The icy bar caresses shins, knees, and thighs, while hips thrust forward pneumatically. The base of the lifter’s neck drips acid, or seemed to, its tickling trickle burning gluteus, hamstring, calf, and heel from the inside out. The weight is returned to the floor with a clatter that sounds like cosmic cymbals striking together. The spandex-clad assemblage laud the effort, the success, the transformation: the lifter is no longer merely a lifter. 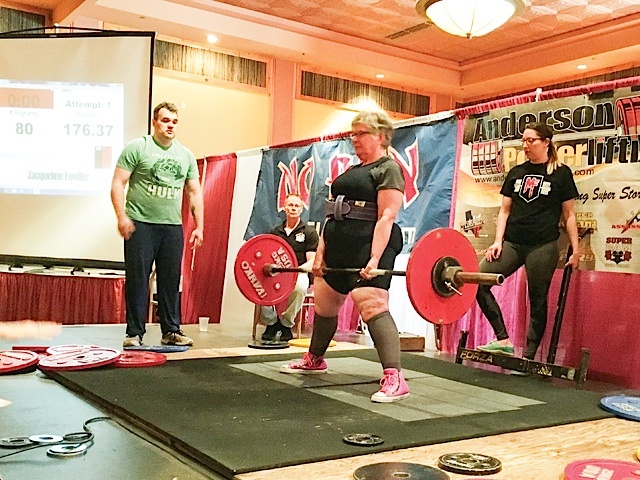 She is Jackie Fendler, affectionately nicknamed “The Hammer” by her many friends and admirers, and, at age 65, she has become the World Association of Benchers and Deadlifters divisional champion. For more information about Jackie’s gym, go to www.bodiesbyburgoon.com.